As we approach the end of Winter Chill in Delhi it’s time to indulge amidst all the impending deadlines. As I write this post, the calendar and the deadlines that I have marked in bold stares at me with a mocking grin. Writing wishes feed into birthday wishes and much more. If you want to take a break from writing woes, take a break. Such re-assurances are rare, and to steal a bright sunny MONDAY afternoon for such plans are some luxuries of being a student. Last Monday afternoon, some of us decided to visit the newly renovated Humayun’s Tomb. Various sections of the historic Humayun’s Tomb have been renovated, restored in patches, blocks and columns. Aga Khan Trust for Culture’s team took six years to restore the complex and for more details on restoration work please read http://www.thedelhiwalla.com/2013/09/16/city-monument-restored-ruin-humayuns-tomb/. After a tour of the historic Humayun’s Tomb, we decided to walk down to the Hazrat Nizamuddin Dargah (the shrine of Hazrat Nizamuddin Auliya, 14th C Sufi Saint). We had heard and read about the Basant celebrations at the Dargah. As we reached the Dargah dressed in our yellow clothes we realised that the celebrations have been shifted to the day of Basant Panchami. Nevertheless, we were treated to wonderful qawali renditions by the qawals of the Dargah. Basant Panchami at the Dargah is a synthesthetic treat. Poet Amir Khusro, whose grave lies at the complex had worn yellow to bring a smile to his beloved Hazrat Nizamuddin who was grieving after his nephew’s death. The tradition has continued and on this day, the qawals sing poems of Khusro. The spring festival of the Dargah is a visual treat as people are dressed in yellow and the mustard flowers and marigold flowers are offered at the shrine. For more details on Basant festivities at the Dargah visit http://www.thedelhiwalla.com/2011/02/08/city-season-%E2%80%93-the-basant-people-hazrat-nizamuddin-dargah/. Do not miss the newly restored Mirza Ghalib’s Tomb on your way into the Dargah. After the qawali, some of us headed back and some of swarmed through the serpentine lane and made our way to Ghalib Kebab Corner. Do not be misled with the poetic connection in the signboard. It is named after Ghalib road that connects to the poet’s tomb. The signboard of the Ghalib Kebab Corner read that it had won the best kebab in the kebab festival hosted by Hotel Maurya Sheraton. Established in 1971, this place is a kebab lover’s delight. Apart from Paneer tikka and Paneer Tikka Roll, there are no vegetarian options here. The shop has a modest seating arrangement with six tables and benches and as soon as you enter you will be spoiled for choices with the cook spreading out mincemeat mix along the skewers… It is an appetizing scene in chilly winter evening. 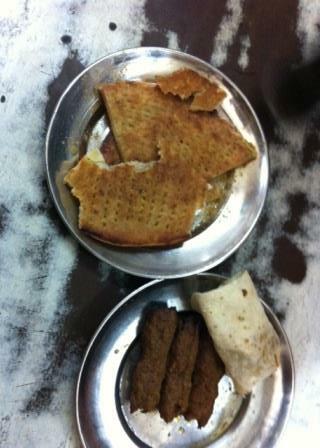 We settled for Beef Kebab Rolls, mutton shammi kebab, beef kebab and Sheer Mal. The juicy kebabs rolled like a wrap in romali roti melted in our mouth, the mutton shammi kebab had a lovely spicy touch to the mincemeat and the sheer mal added the perfect sweet touch to every bite of spicy shammi kebab… A treat and must visit!!!! 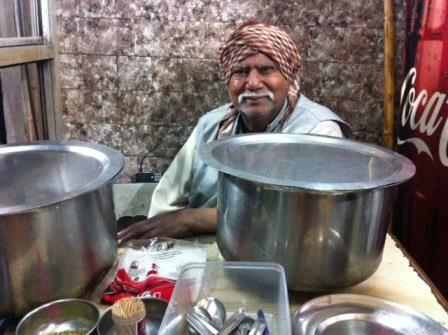 The kebabs are priced between Rs 50 to Rs 100. 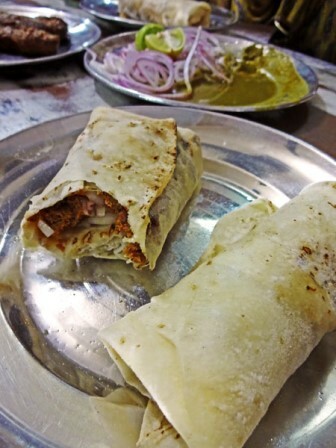 Some of our friends recommended Mutton Qurma but itiriti recommends you to try out their Beef Kebab Roll, Mutton Shammi Kebab and Sheermal. I am definitely going back for a lunch / dinner treat after I finish my chapter. So in case you are yet to plan your weekend stopover at Ghalib Kebab Corner for kebab treats! Shop No : 57, Near Lal Mahal, Ghalib Road, Hazrat Nizamuddin, New Delhi-110013. Phone: 9810786479.